Centrifugal force calculator helps you find the force acting on a rotating object basing on its mass, velocity and radius of rotation. You can use it not only to figure out how to calculate centrifugal force, but also the acceleration and angular velocity of the object. Read on to learn what is the centrifugal force definition and how to apply the centrifugal force equation. The relation between force and acceleration for objects moving in a straight line can be found in our acceleration calculator. Centrifugal force is the inertia force that arises in each rotating object. It is only required in a rotating reference frame - or, in other words, when we look at the system from the point of view of the object in motion. According to Newton's first law, if no force acts on an object, it moves in a straight line. For rotation to occur, a centrifugal force - acting outwards from the center of rotation - must be applied. If you know only the angular velocity ω, you can recalculate it to normal velocity by simply multiplying it by the circumference of the circular path. Use the following equation: v = ω * 2 * π * r. Or simply type the values of ω and r into our calculator. Find the mass of the object - for example, 10 kg. Determine the radius of rotation. Let's assume it's 2 m.
Determine the velocity of the object. It can be equal to 5 m/s. If you know the angular velocity only, you can use the formula v = ω * 2 * π * r to calculate the velocity. 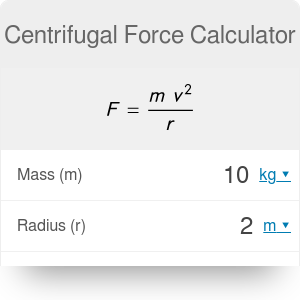 Use the centrifugal force equation: F = m * v^2 / r. In our example, it will be equal to 10 kg * (5 m/s) ^2 / 2 m = 125 kg*m/s^2 = 125 N.
Our centrifugal force calculator can also be used to find centrifugal acceleration a by using the simple formula: a = F / m.
It works in reverse, too - for example, you can find the mass of the object with given velocity, centrifugal force and radius. Since you know the mass and velocity of the object, you can also find its kinetic energy. Centrifugal Force Calculator can be embedded on your website to enrich the content you wrote and make it easier for your visitors to understand your message.